Reaching your ideal fitness goals is a long and hard journey to undertake. Once you have reached your goals there is another challenge you have to go through: maintaining them. Many people tend to forget that fitness means consistency with diet and working out. Balancing the two is the only way you can stay in shape for the long-term. Although jogging and other cardio exercises are the go-to of many people, sometimes this isn’t enough, especially when your goal is to tone your muscles. Oftentimes, people lift weights and do other exercises after finishing their cardio routine. The problem with this kind of segmented workout session is that you lose steam and get tired early before you can complete your muscle toning workout. For those who want to make their workout routine more productive without sacrificing too much time, there is a machine you should explore: the rowing machine. Rowing machines are known for giving users the full-body work out that they need. Everything from cardio to muscle toning is addressed by this one machine. If you are willing to invest in one for your home gym, this review of the First Degree Fitness Newport AR Rower Water Rower will make a good read. The First Degree Fitness Newport AR Rower Water Rower is a great machine to use for a full-body workout. It offers excellent resistance that can be adjusted according to the user’s needs. More water in the strong and sturdy tank means more resistance and a better workout session. The machine is also handy for older people who do not want to strain their backs but still want a complete workout that tones muscles and raises the heart rate. It is very easy to assemble as well because some of the parts come pre-assembled and the assembly kit includes all the tools you need, so users can put the machine together in less than an hour. The rower is also very durable and built very strong because of its metal body so there’s no need to worry about parts suddenly breaking off while rowing. The water rower is also relatively quieter than other rowers so users are able to listen to music or watch TV while they row, a big advantage to keep your mind distracted and allow you to continue with your workout. The adjustable resistance is a big plus for those who want to build their stamina over time. The moment the machine’s resistance is no longer a challenge it means you are building up your strength and stamina. Despite its metal body, this rowing machine is still lightweight and portable. So if you want to move it around your gym even after setting it up it will not be an issue. If you want to store it away after every session, you can simply empty the tank and keep the machine until your next session. You can also easily monitor your progress using the computer screen and note if you’re stamina has improved over time. 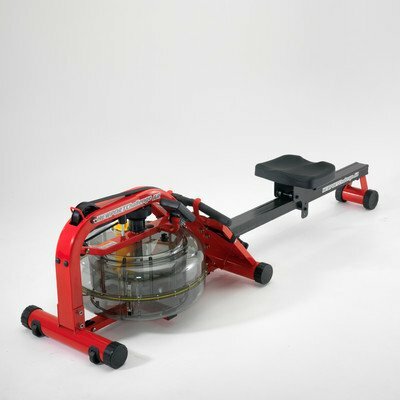 Whether you intend to use this machine for working out or to refine your rowing techniques, it will do the job. It is a smooth operating machine built to last, making it a great investment for maintaining your physical fitness. Adding this machine to your home gym won’t disappoint. One big disadvantage of this particular rowing machine is the lack of information about warranties. The manufacturers are also very hard to contact so you may encounter a snag in case you need parts replaced. This can be disconcerting, but since the rowing machine is made with high-quality and durable materials this isn’t a very big issue. Another disadvantage raised is the weight limit of the machine. There are some issues about the machine bucking for people who weigh more than 150 pounds. This is potentially dangerous for users who like to row with full strength, but it can quickly be remedied with the use of weights on the legs. If you find that the machine cannot withstand your pull and strength, discontinue use to avoid any injuries. The First Degree Fitness Newport AR Rower Water Rower is a great addition to any home gym, especially for those interested in rowing. It is dependable, sturdy, and performs as expected, making it a great choice as far as water rowing machines go.